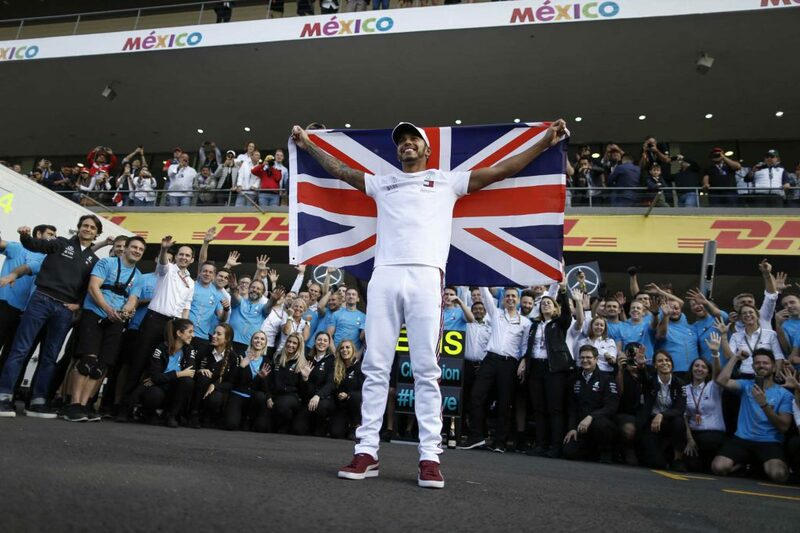 Max Verstappen might’ve won the Mexican Grand Prix, but fourth-placed Lewis Hamilton stole the headlines by winning his fifth world championship in a difficult race for Mercedes. 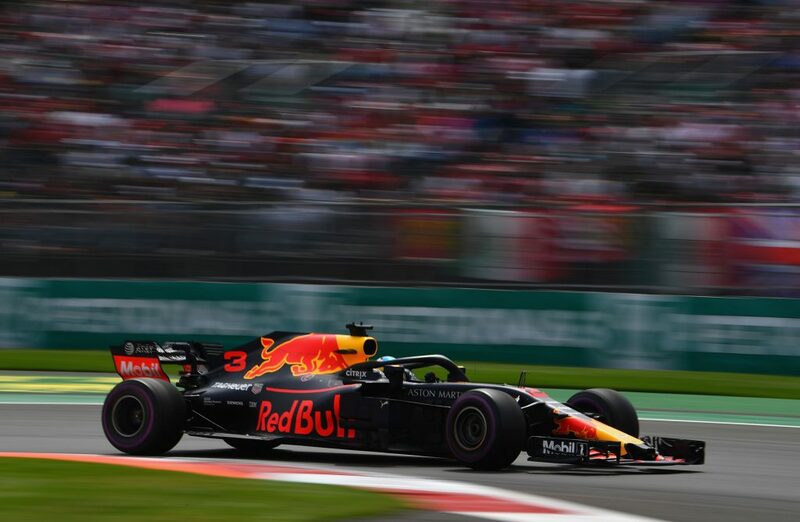 Verstappen was in control for the duration of the race, but Red Bull Racing was never truly comfortable, with significant concern about tyre life dictating strategy throughout the field. 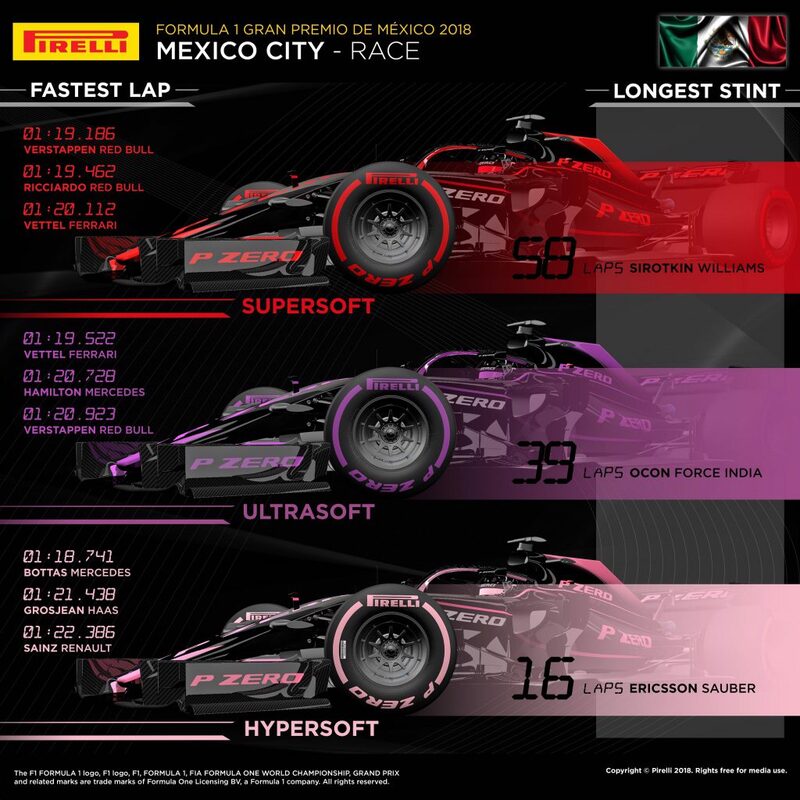 Mexico City sit at more than 2.2 kilometres above sea level, where the air is approximately 22 per cent less dense tan at the average racing circuit. This has a significant effect on aerodynamics — it’s not unusual to hear it said that the cars are running Monte Carlo aero kits but producing Monza-levels of downforce — which in turn make managing the tyres extremely difficult. The lack of downforce means less grip, and if this lack of grip is poorly managed, tyre life can be diabolical. This was particularly the case with the hypersoft tyre, which Friday practice suggested would last barely a handful of laps in race conditions. 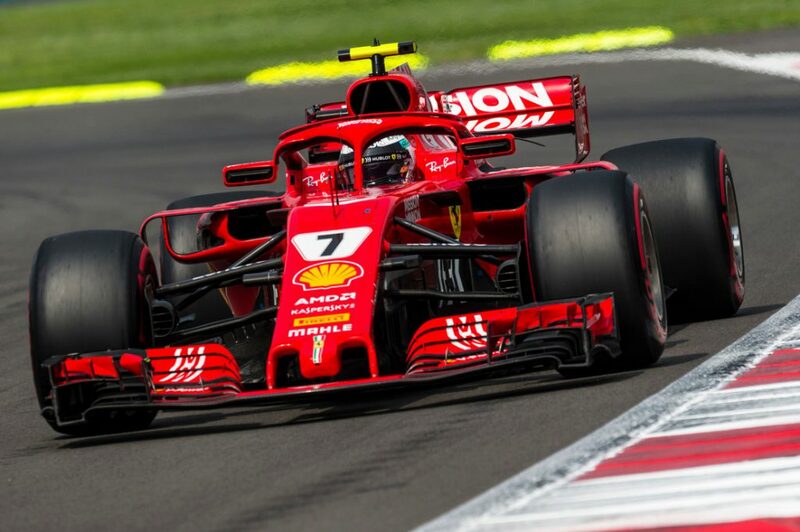 Unfortunately for the teams, they had loaded up on hypersofts and brought very few ultrasofts or supersofts, meaning they had little choice but to save the more durable compounds for the race without giving their drivers the opportunity to try them out during Friday or Saturday practice. The unusual conditions meant there was significant uncertainty about whether the fastest strategy would require one or two stops. The long and fast front straight means pit stop time loss is high, but the sort of extreme tyre management required to pull off a one-stop could have similarly lost significant time. Most teams were desperate to avoid the hypersoft tyre. The frontrunning teams had their six drivers use ultrasofts ins Q2 to set the purple-striped compound as their starting tyre, but the midfield is too closely contested to risk using slower compounds, so both Renaults and both Saubers from places seven to 10 committed to starting on the delicate pink tyre. Force India tapped itself out of the battle for the top-10 shootout, deliberately sending Esteban Ocon and Sergio Perez out on the ultrasoft compound to qualify just on the cusp of Q3. The strategy was a success, with Ocon 11th and Perez 13h on the grid and therefore with free tyre choice for the start of the race. The decisive moment in the battle for the lead was the start. Polesitter Daniel Ricciardo, starting from the head of the grid for just the third time in his career and for the first time outside Monaco, bogged down with wheelspin and ceded places to teammate Max Verstappen, who took the lead, and Lewis Hamilton. 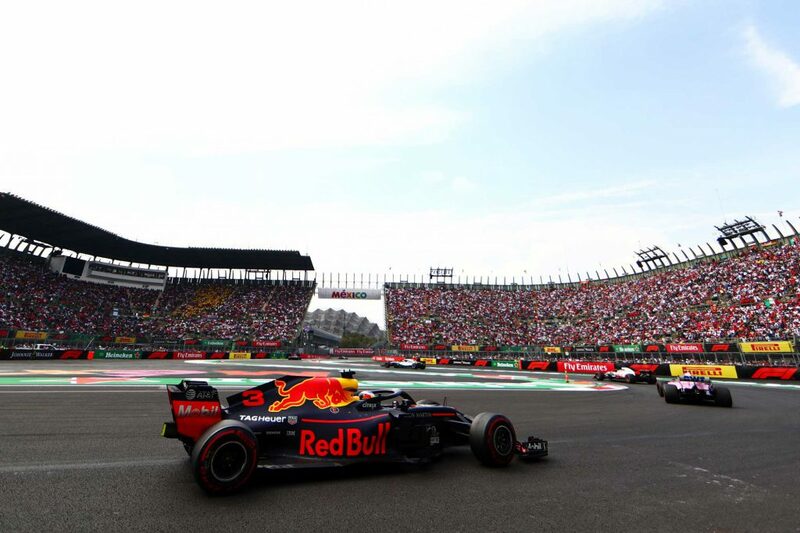 The Red Bull Racing RB14 had looked the class of the field in the unusual Mexico City conditions all weekend, but in clean air it was unstoppable. Verstappen was never really threatened for the rest of the race and had little trouble building and maintaining a healthy gap. But while Verstappen sprinted away, Hamilton was able to use his superior straight-line speed to keep Ricciardo frustrated in third despite the Australian being notably quicker. Sebastian Vettel, however, had no trouble passing both with Ferrari’s impressive power output. He swept into second place and made slow but steady progress on Verstappen’s sizable lead. 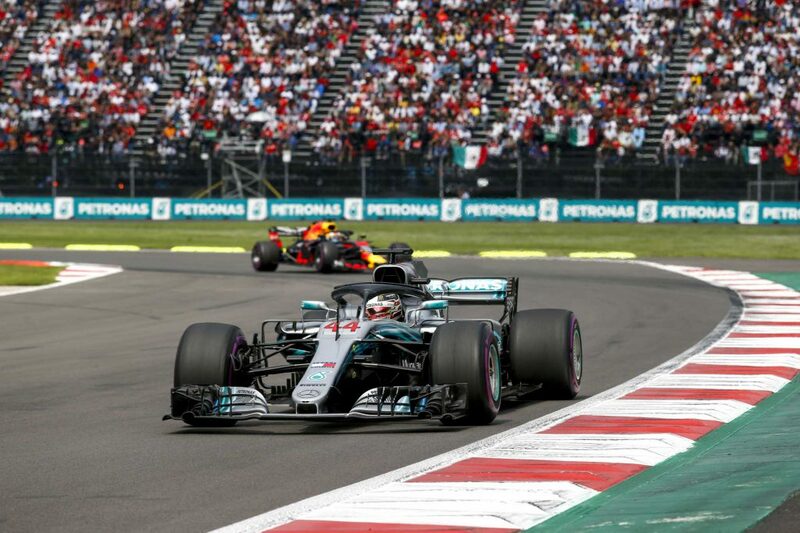 It took Ricciardo until lap 47 to get past, when Mercedes’s excessive tyre wear was brought to bear on Hamilton’s strategy and forced him into a second stop, from which he exited the pits in fifth behind Kimi Raikkonen. This was effectively the end of Hamilton’s race as Mercedes had no new tyres to give him, opting instead for a set of lightly used ultrasofts. The management required to make it to the end with the purple rubber was immense, and he finished almost 80 seconds behind Verstappen. Hamilton’s tyre change triggered Vettel to do likewise. Verstappen also made a stop, but his lead was so large that he maintained the lead. Ricciardo was tactically left out after Red Bull Racing had inspected Verstappen’s worn supersoft tyres and found them to be capable of making it to the end of the race, but the Australian could also act as a buffer between his leading teammate and third-placed Sebastian Vettel, a task he executed admirably until a hydraulics failure eliminated him from the race — but by then Verstappen was unreachable anyway. The midfield is so tight that oftentimes this season cars starting just outside the top 10 on a more durable tyre have easily outmanoeuvred their top-10 midfield rivals who have been forced to start the race on qualifying rubber that lasts only a handful of laps. Force India expected this to be the case in Mexico. Ocon’s race floundered from the get-go, losing part of his wing in a first-lap skirmish requiring an immediate pit stop. He ran until lap 30 on supersofts and then switched to ultrasofts thereafter, but it was too ambitious a run on the purple compound, and he was passed by Gasly, who was on supersofts, before the end of the race, losing him a points finish. 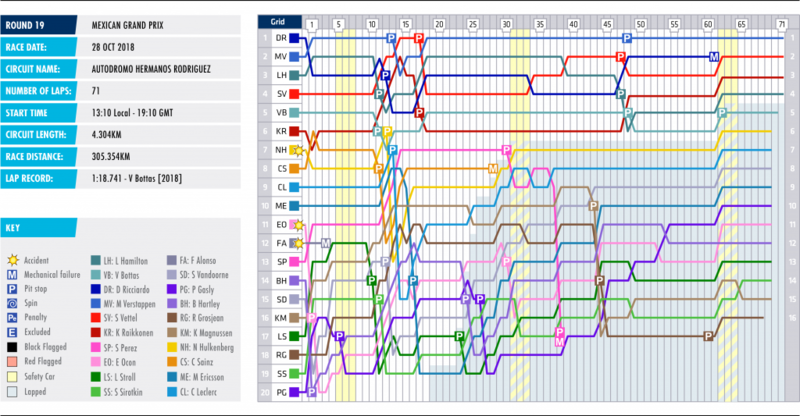 Perez’s race was more promising. He made it up to seventh before making his sole stop on lap 30 for a used set of ultrasofts, but he became embroiled in a battle with Charles Leclerc for eighth, costing him valuable time to Nico Hulkenberg in seventh. He got past him on lap 34, but he retired from the race three laps later. 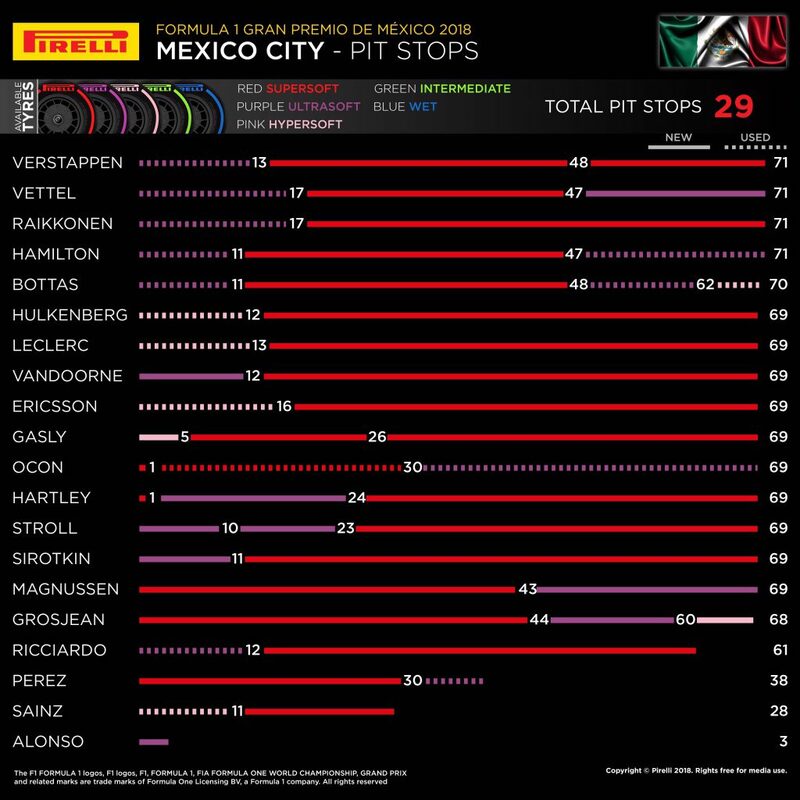 Perez is adamant he could’ve finished seventh, but the supersoft tyres, once they had battled through an initial graining phase, should have been a better compound than the Mexican’s ultrasofts. Leclerc was on the same strategy as Hulkenberg, which could’ve brought him back into contention for eighth later in the race had Perez not retired. The solidness of the supersoft tyre as a racing compound was underlined by Stoffel Vandoorne, who made his sole stop off ultrasofts on lap 12 to finish the race with one long stint on supersofts, the red-marked tyre good enough to help him up from 15th on the grid to eighth behind Leclerc. Pierre Gasly ran an unusual two-stop race, switching off new hypersofts on lap five — Toro Rosso figured most cars would be stopping early, so he may as well have the fastest tyre — onto new supersofts, and he took another set of new supersofts on lap 26. He was last after his final stop, but recovered places after both Haas drivers made their sole stops, by passing both Williams cars and Esteban Ocon, and by Brendon Hartley copping a penalty and letting him past as a result. 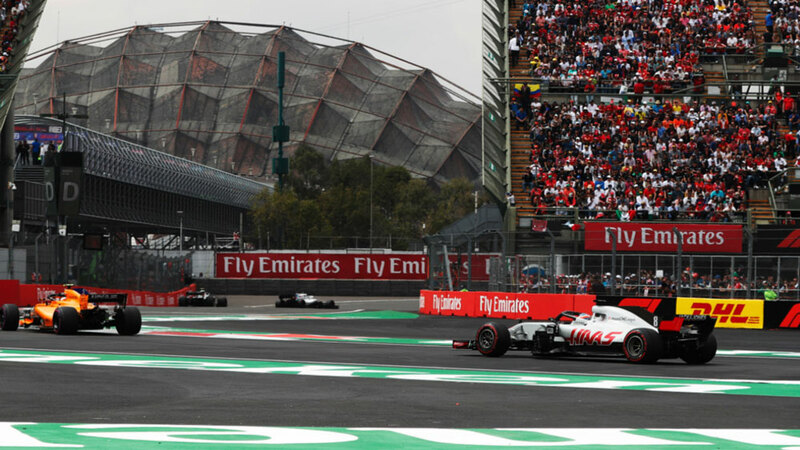 Haas has always struggled in Mexico, and for the third year in a row it was knocked out of qualifying in Q1. 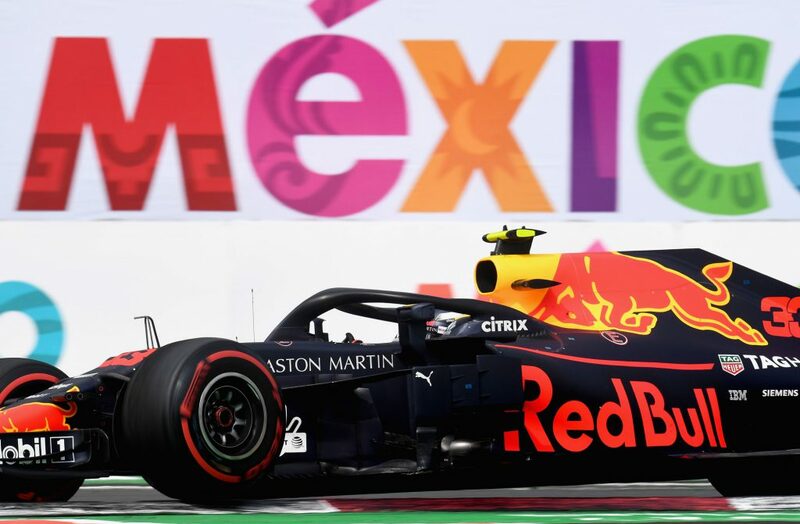 The American team has always struggled to generate maximum downforce, and the requirement to put as much downforce on the cars as possible in Mexico could be one explanation for their sustained difficulties. The team attempted to run a long reverse strategy, starting on the supersoft compound and making a late change for ultrasofts, but neither Kevin Magnussen nor Romain Grosjean could build the sort of gap required over the midfield during the offset laps to make it work. The fell to last after their stops, where they remained to the end of the race.